Typical naval deck mounting. An early long cartridge case for gunpowder propellant is upended at bottom left, a shell stands next to the cartridge. In UK service it was known as the QF 6-inch Mk I, II, III guns. 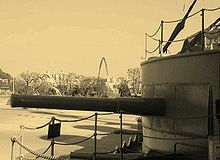 [note 1] As the 15 cm/40 (6") 41st Year Type naval gun it was used for pre-dreadnought battleships, armoured cruisers and protected cruisers of the early Imperial Japanese Navy built in UK and European shipyards. It was also the heaviest gun ever carried by a pre-Cold War destroyer. These guns were developed to exploit the new "QF" technology, which involved loading the propellant charge in a brass case with primer in its base. The brass case also sealed the breech, allowing a lighter mechanism. This was presumed to allow a faster rate of fire than the older "Breech Loading" system, where the propellant was loaded in cloth bags and then a separate friction or percussion tube fitted into the breech for firing. The QF principle had proved successful with the much smaller QF 3 pounder Hotchkiss and Nordenfelt QF 3 and 6 pounders from 1885 onwards. The Mk I was an Elswick gun of built up construction. Mk II was built by Woolwich Arsenal and in 1891 became the first Royal Navy gun using the Armstrong wire-wound construction. The breech mechanisms were developed from the existing 6-inch (150 mm) BL mechanisms, but as it no longer had to provide obturation (sealing of the breech), the front was made coned rather than straight which allowed it to be swung round to the side before it was fully withdrawn, rather than having to be fully withdrawn before swinging to the side as with the BL gun. The preceding generation of British 6-inch guns (BL Mks III, IV and VI) had old-style trunnions by which they were mounted on Vavasseur inclined slides to absorb recoil. 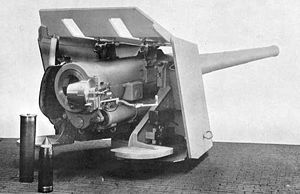 QF Mk I and II dispensed with trunnions and instead on the lower side of the breech ring were lugs to which were attached modern recoil buffer and hydrospring recuperator (runout) cylinders to absorb recoil and return the barrel to loading position after firing. This allowed the gun to recoil directly backwards rather than backwards and upwards as previously and is the recoil system which in essence is still in use. Mk III was built by Elswick and was similar to Mk I except that it had trunnions which allowed it to be deployed on the remaining obsolescent but still in service Vavasseur recoil mountings. All 3 Marks had the same dimensions and performance. As the QF 6 inch Mk I, Mk II and Mk III, the gun was used as secondary armament of pre-dreadnoughts of the 1890s and cruisers to 1905. On the armoured cruisers of the Diadem, Powerful and Edgar classes they made up most of the armament, though the latter class carried two 9.2-inch (230 mm) guns as well. 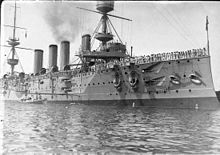 The pre-dreadnought battleships of the Royal Sovereign (including the turreted HMS Hood), Centurion, Majestic and Canopus classes carried up to 12 guns. 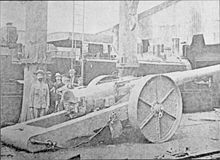 During the Second Boer War one gun was brought ashore from HMS Terrible in Natal in February 1900 at the request of General Buller, presumably in response to the failure at Colenso. It was mounted on an improvised field carriage by Captain Percy Scott and transported by rail to Chieveley, just south of Colenso. There it was manned by Royal Navy gunners to provide useful fire support for the British Army during the relief of Ladysmith. It is reported on 17 February to have fired from "Gun Hill" (a small kopje two miles (3 km) north of Chieveley) and knocked out a Boer gun at 16,500 yards (15,100 m), followed by a Boer searchlight, as Buller approached Ladysmith from the South East and pushed the Boers back towards the Tugela river. On 26 February Lieutenant Burne reports firing from the same position on a Boer gun at 15,000 yards (14,000 m) at 28° elevation and falling 200 yards (180 m) short. The 7-ton weight (compared to the 2½ tons of the Boer 155 mm "Long Tom") meant that it was effectively immobile on the battlefield and could not be moved forward to shorten the range. Two guns were also mounted on armoured trains, crewed by Royal Garrison Artillery men. From 1894 a number of guns were adapted for coast defence use, with the original 3-motion breeches replaced by modern single-motion breeches to increase the rate of fire, which designated them as "B" guns. Nineteen guns were still active in the defence of the UK as at April 1918 : Jersey (2), Guernsey (2), Alderney (2), Shoeburyness (2), Blyth (2), Clyde Garrison (1), Mersey (2), Berehaven Garrison (Bantry Bay, Ireland) (6). 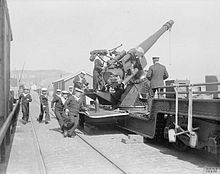 At least one gun is known to have been mounted by the Royal Navy on an improvised anti-aircraft mounting on a railway truck, defending docks during the First World War. In World War I Britain urgently needed heavy artillery on the Western Front, and various obsolete 6-inch naval guns were converted to 8-inch howitzers. Sixty-three QF 6-inch Mk II guns were shortened, bored out to 8 inches (203 mm) and converted to BL type to produce the BL 8-inch howitzer Mk V. Four entered service in December 1915 and 59 followed in 1916. The Elswick export designation for guns sold to Italy and Japan was Pattern Z and Pattern Z1. In Italian service they were known as Cannone da 152/40 A Modello 1891. These guns armed armoured cruisers, ironclads, pre-dreadnought battleships, protected cruisers and scout cruisers of the Regia Marina. They served aboard Regia Marina ships in the Italo-Turkish War and World War I. The Type 41 naval gun was designed by Armstrong Whitworth, Elswick, Newcastle upon Tyne, England as a slightly modified version of the Elswick Ordnance Company QF pattern 6-inch (150 mm) guns used on contemporary Royal Navy battleships. The Elswick export designation for guns sold to Italy and Japan was Pattern Z and Pattern Z1. They were the standard secondary armament on pre-dreadnought battleships and the main battery on several classes of armoured cruisers and protected cruisers of the Imperial Japanese Navy. They served aboard Japanese ships in the First Sino-Japanese War, Russo-Japanese War and World War I. The gun was officially designated as “Type 41” from the 41st year of the reign of Emperor Meiji on 25 December 1908. It was further re-designated in centimetres on 5 October 1917 as part of the standardisation process for the Imperial Japanese Navy converting to the metric system. The Type 41 6-inch (150 mm) gun fired a 100-pound (45.4 kg) shell with either an armour piercing, high explosive or general purpose warhead. An anti-submarine shell of 113-pound (51.3 kg) was developed and in service from 1943. Three guns were mounted on each of the two Romanian Aquila-class scout cruisers, Mărăști and Mărășești. However, the two warships were reclassified as destroyers upon commissioning, despite retaining the 6-inch guns for the years to come, thus making the gun the heaviest artillery piece ever mounted on a pre-Cold War destroyer. These guns were adopted in very limited quantity by the United States Army Coast Artillery Corps as part of the Endicott period fortifications, and were initially mounted 1898–1907. They were acquired in 1898 due to the outbreak of the Spanish–American War. It was feared that the Spanish fleet would bombard US ports, and most of the Endicott forts were still years from completion. So the 6-inch guns, along with 34 4.7-inch Armstrong guns and 21 8-inch M1888 guns on 1870s carriages, were acquired to quickly arm some forts with modern quick-firing guns. They were designated as "6-inch Armstrong guns" and mounted on pedestals in US service, and appear to have been withdrawn from service by 1925. A total of nine guns were mounted in one-, two-, or three-gun batteries, with four of the nine transferred to Hawaii 1913–1917. 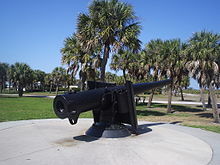 Eight guns were initially at Fort Williams (Maine) (1), Fort Greble, Rhode Island (1), Fort Wadsworth, Staten Island, NY (2), Fort Moultrie, Charleston, South Carolina (1), Fort Screven, Tybee Island, Georgia (1), and Fort Dade, Tampa Bay, FL (2). The guns at Fort Greble and Fort Moultrie were dismounted in 1903-04. In 1907 three guns were mounted at Fort Adams, Rhode Island, probably the two dismounted guns plus one either newly acquired or from spares. The four guns from Fort Williams and Fort Adams were transferred to Ford Island, Pearl Harbor, Hawaii as Batteries Adair and Boyd beginning in 1913. The two from Fort Dade survive at Fort DeSoto near St. Petersburg, Florida. Their battery at Fort Dade has succumbed to tide action over the years. Two coast defence guns at Fort DeSoto, Florida, USA. ^ Mk I, II and III = Marks 1, 2 and 3. Britain used Roman numerals to denote Marks (models) of service ordnance until after the Second World War. 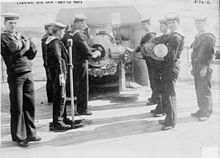 This article describes the first three models of Royal Navy 6-inch QF guns. ^ 2154 ft/second in British service firing 100 lb (45 kg) projectile, using 13 lb 4 oz (6.0 kg) Cordite size 30 propellant, at 60 °F (16 °C). 1,882 ft/s (574 m/s) using 27 lb 12 oz (12.6 kg) gunpowder propellant. From Text Book of Gunnery, 1902. ^ Hogg & Thurston 1972, Page 140. ^ Hall, D.D. (3 June 1978). "THE NAVAL GUNS IN NATAL 1899–1902". Military History Journal. The South African Military History Society. 4 (3). ISSN 0026-4016. Retrieved 10 November 2009. ^ Major D Hall, The South African Military History Society. Military History Journal – Vol 2 No 2 December 1971. "Guns in South Africa 1899–1902 Part III and IV"
^ Hogg & Thurston 1972, Page 206. Brown, D. K. (2003). The Grand Fleet: Warship Design and Development 1906–1922. Caxton Editions. ISBN 978-1-84067-531-3. Gardiner, Robert; Lambert, Andrew (eds.). Steam, Steel and Shellfire: The Steam Warship, 1815–1905. Conway's History of the Ship. Book Sales. ISBN 978-0-7858-1413-9. Hodges, Peter (1981). The Big Gun: Battleship Main Armament, 1860–1945. United States Naval Institute Press. ISBN 0-87021-917-0. Wikimedia Commons has media related to QF 6 inch /40 naval gun. DiGiulian, Tony. "Japanese 15.2 cm/40 (6") Type 41". NavWeaps.com. DiGiulian, Tony. "British 6"/40 QF Marks I, II, and III". NavWeaps.com. This page was last edited on 3 April 2019, at 22:33 (UTC).